Oh… To Wake Up One Day and Know! When I first entered into recovery just over four years ago, I was sure I was done. Sadly, I had to have one more night to “prove” something (to myself, to others, to who, I don’t know). But that night, oh that night, I fell asleep (passed out) and awoke the next day with this overwhelming pain, anger, frustration, and sadness. I simply knew… knew deep down to the core… that I NEVER wanted to feel that way ever again. No more nights of which I recall nothing. No more covering up the emotions. No more hiding from my life. It is now or never. 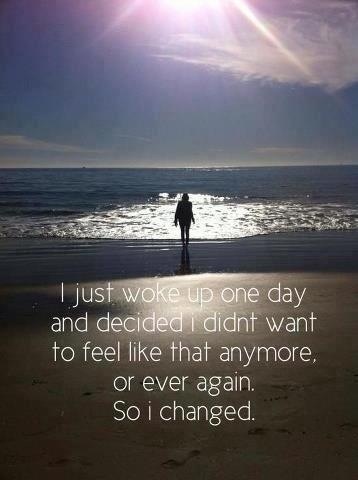 I have known many people in recovery who have said they woke up one day and just knew. Over the past four years, I nodded my head as they spoke, but in reality, I had never experienced an AHA moment like theirs. I originally got sober for other reasons. I got sober to make my children happy. I got sober to prove something to myself. I got sober to please my mother, who had lived with my alcoholic father until he passed away too soon. But I really didn’t get sober for myself. When I relapsed a few months ago, I know now that it happened because I have a disease. My disease was untreated alcoholism. Yes, I was going to meetings. Yes, I was hanging with sober people. But I was not working the steps. In fact, when people said “work the steps”, I honestly had no idea what the hell they were talking about. I can say now that I understand. Today, I am awake and aware. I am learning, in baby steps, how to trust and believe in my higher power. I will wake each day knowing… just knowing… because I do not ever want to feel that way again. I know I will have moments, hours, and days in which I doubt this, or in which I will conveniently forget. So I am writing these words to remind myself! Indeed. In my”empty days” I used to zone out in front of Dr. Phil and I really got a kick out of watching him let some man or woman trample through how messed up things had gotten for them. They would conclude their sad — and at times brutal — tales of how they had ended up as a perfect candidate for Dr. Phil by sincerely documenting their best intentions and efforts to realign their universe. Dr. Phil would unravel their entire life by asking one simple and thoughtful question: “So… how’d that work for you?” Honestly, even though it’s been a good number of years since I’ve watched television, that question has stayed with me all these years later and probably will the rest of my life.